If you would like to post an oncology-related position on our website, please email your job description being as brief as possible, create a heading similar to those below, include all links, and email to vetcancersociety@yahoo.com. FREE POSTINGS: Beginning November 1, 2018, for VCS members only. As long as there is a current VCS member in the clinic or hospital that is providing the advertisement, the cost to post the ad is free. If no VCS members exist in the hospital or clinic to which you are advertising, the cost is $300 for a 90 day listing. Contact vetcancersociety@yahoo.com for credit card payment details and to submit your advertisement. The Oncology Service (TOS) at the Veterinary Referral Center of Northern Virginia (VRC-NoVA) located in historic Manassas, Virginia is looking for a Medical Oncologist! We are seeking a board-certified or eligible residency-trained Medical Oncologist to join our growing practice at this new location. VRC-NoVA is a thriving emergency/specialty practice including surgery, internal medicine, emergency and critical care. As this will be a new service at VRC, the successful candidate will help to start and grow the Medical Oncology department but will have the support of the TOS network of over 10 oncology veterinarians in the Virginia region. Minimum completed veterinary oncology residency with board exam scheduled: ideally Diplomate, ACVIM (Oncology). Ability to become licensed to practice in the state of Virginia. Professional comportment and appearance, with excellent interpersonal skills and a positive, diplomatic attitude. Have and continue to develop an in-depth knowledge of the field of Veterinary Oncology, including latest ideas, methods, and scientific understanding in the field. Independently create and manage treatment plans for new and existing TOS patients. We offer a competitive benefits package, compensation and a desirable work schedule. Interested applicants should be highly motivated to provide the highest quality patient and client care in an environment that prizes collaboration and innovation. The Ottawa Animal Emergency & Speciality Hospital (OAESH) is seeking a board-certified Oncologist to join our growing practice. We also welcome individuals who have completed a residency training program and are waiting to pass their boards. This is an exciting opportunity to work in a rapidly growing environment within a brand-new state-of-the-art facility. The emergency and critical care service is staffed with 10 full-time emergency veterinarians and supported by a team of experienced emergency technicians and animal assistants working around the clock to provide exceptional care to our patients. We are looking for an enthusiastic applicant that will share our passion and will take an active part in the advancement and development of our emergency and critical care service. OAESH is one of a kind! Locally-owned by veterinarians practicing in Ottawa, it opened its doors in April 2018 in response to a growing need for veterinary emergency and speciality care in the area. It has been growing every day since. Specialities offered include internal medicine, surgery, dentistry, dermatology, anesthesiology, and part time oncology. We are next-door neighbour with a neurology/neurosurgery practice and share access to their high-field MRI and multi-slice CT scan. Our modern hospital is equipped with complete in-house lab, digital radiology, ultrasound, endoscopy, blood transfusion capabilities, and more. Located near downtown Ottawa, ON and 10 minutes from Gatineau, QC, the OAESH is serving a 1.8 million population. Ottawa is the nation’s capital and the fourth largest urban region in Canada. It consistently ranks as one of the best places to live both in Canada and North America. If you are looking for a family-oriented city with a rich multicultural diversity, a low crime rate, and lots of green space and bike paths, Ottawa is waiting for you! Competitive compensation package, including CE stipend, association dues, medical/ dental benefits, cell phone plan, relocation assistance and signing bonus. We are seeking a board-certified or eligible residency-trained Medical Oncologist to join our well-established and growing practice. The Oncology Service (TOS) at Dogwood Veterinary Emergency and Specialty Center in Richmond, Virginia invites applicants for a 1-year Veterinary Oncology internship. This is an internship with a busy private practice medical and radiation oncology group in Richmond, Virginia located within a large veterinary referral center. TOS has been providing oncology care for companion animals in the Mid-Atlantic area for over 15 years. We currently have 3 practice locations in Virginia offering medical and radiation oncology. Our practice is dedicated to the integration of personalized and compassionate care with cutting edge options for cancer. Program description: The intern’s duties will consist of assisting the oncologist seeing consultation cases as well as doing the majority of the paperwork associated with the new patients in order to develop a treatment plan and accurate assessment of the prognosis for those patients. This position provides time spent with both our medical and radiation oncologists and services. We see patients Monday-Friday with no weekend or emergency in hospital responsibilities. Phone triage is shared among the various locations so responsibilities after hours are minimal. We are an oncology-specific specialty practice operating within a large multi-specialty hospital (Dogwood Veterinary Emergency and Specialty Center). Our Richmond radiation center is less than 3-years old and is equipped with a Varian capable of IMRT/IGRT/SRT. The radiation center also houses an 8-slice GE CT scanner located immediately adjacent to the linac. This is a unique practice opportunity as part of a multi-disciplinary oncology team focused on providing our patients and clients with innovation and state-of-the-art care. Salary and Benefits: $30,000 plus health and other benefits. Prerequisites: Doctor of Veterinary Medicine or equivalent degree, and successful completion of a rotating internship in small animal medicine and surgery. We are looking for a Staff Clinician/Lecturer in Veterinary Oncology in the Department of Clinical Science and Services. This person would work mainly from our Hawkshead Campus, a 15-minute train ride from the centre of cosmopolitan London. The candidate would join our existing Oncology team and will be expected to enhance the department’s reputation through scholarship in clinical activities and teaching. You will achieve this by delivering professional services within the College’s hospitals, delivering clinical training on veterinary and paraveterinary undergraduate curricula and participating in postgraduate training programmes. We are looking for true team players with exceptional leadership and communication skills and who are enthusiastic about working with students, including supporting undergraduate and postgraduate research projects. We are looking for candidates with a RCVS registrable degree in veterinary science, who hold or are eligible to obtain an American or European postgraduate diploma in Veterinary Oncology. A background in research work in one of the College’s areas of special interest and a PhD, although desirable, are not essential. Additionally, there is potential for applicants only seeking a fixed term contract to come on a temporary basis for a year. Please contact us to discuss if this is your preference. Long Island Veterinary Specialists (LIVS) in Plainview, NY is seeking a Board Certified Oncologist or Residency Trained Candidate to join our growing team of specialists. The Oncologist will join a strong and cohesive team working alongside experienced Internal Medicine and Critical Care Specialists while enjoying a four day work week. Each staff member is assigned a dedicated Doctor Coordinator in addition to Licensed Veterinary Technicians and Assistants. This support structure facilitates medical activities, allowing the doctor to focus solely on practicing exceptional medicine. Long Island Veterinary Specialists is a well-established AAHA certified specialty hospital serving our community for over 20 years. Housed in a bustling 30,000 square foot facility, the LIVS Oncologist will have access to extraordinary diagnostic and medical technologies which include a Philips 3 Tesla MRI, Siemens Sensation 16 multi-detector CT scanner, dedicated Idexx blood lab stations, two digital radiography suites, electronic brachytherapy, and I-131 therapy, as well as newly renovated oncology suites to be built in 2019. LIVS has a substantial commitment to research and clinical studies supported by a research coordinator and the Statistics Department of a regional medical school. With a staff of over 180 enthusiastic professionals, the Oncologist at LIVS will work amongst published, world-renowned specialists including five Surgeons, three Internists, and specialists in a variety of disciplines including: Behavior Medicine, Dermatology, Neurology, Ophthalmology, Critical Care, Integrative Medicine, and Rehabilitation Therapy. LIVS is located in Nassau County, Long Island; which offers both the big city and small town feeling. Enjoy beautiful white sand beaches on the Atlantic Ocean and miles of rugged coastline on the tranquil Long Island Sound. Discover charming villages and downtowns, fascinating museums, world-class shopping, top-notch hotels and restaurants, scenic hiking trails, picturesque public gardens, bike paths, swimming, surfing, boating and fishing. All this is and Manhattan is just a quick 30 minute trip away. The ideal candidate for this position performs well as a team member and exhibits excellent communication and client service skills. Long Island Veterinary Specialists is where progressive medicine is performed and its staff holds strong to the belief that client service, referring DVM communications and staff morale are just as important. LIVS offers an incentive-based compensation plan with a guaranteed base salary, a signing bonus, as well as an excellent benefits package including: health insurance, paid time off, matching 401K, continuing education allowance, and paid professional dues. Purdue University College of Veterinary Medicine (PVM), Department of Veterinary Clinical Sciences (VCS), invites applications for a full-time (12 month) tenure-track or clinical-track faculty position in Veterinary Radiation Oncology at the Assistant Professor level. Radiation Oncology has strong existing programs in translational cancer research through the Purdue University Center for Cancer Research (www.cancerresearch.purdue.edu/), the Purdue Comparative Oncology Program (www.vet.purdue.edu/pcop/), and the Oncological Sciences Center at Discovery Park (www.purdue.edu/discoverypark/oncological/). The successful candidate will join an established radiation oncology team consisting of one board certified radiation oncologist, one radiation therapist, one veterinary technician and two radiation oncology residents. Purdue Radiation Oncology is a primary receiving service, and is the only site in the Midwest offering stereotactic radiation therapy for head and neck tumors. Resources include a Varian EX 6MV linear accelerator with 120-leaf MLC, sliding window IMRT delivery, Varian Aria R & V system, Varian Eclipse treatment planning system, and Kodak CR portal imaging. Purdue’s Veterinary Teaching Hospital imaging section provides an integrated PACS/RIS/HIS system, with digital radiography, ultrasound, 64-slice spiral CT, 1.5 T MRI and nuclear medicine modalities in-house. A Life Science 3T MRI facility on campus is also available for research use. PVM is highly supportive of individual faculty career growth and development. A formal faculty mentoring program is in place. The successful candidate will actively participate in the discovery, learning and engagement activities of the PVM and VCS department. These activities include: Discovery: Mentoring in graduate programs (MS and PhD). Clinical-track faculty may participate in research that complements current faculty interests and strengths (www.vet.purdue.edu/vcs/). Tenure-track faculty are expected to build an independent research program Learning: Participation in lectures and laboratories in the DVM and veterinary technology curriculum; clinical teaching in the Veterinary Teaching Hospital; participation in the training of house officers. Clinical Service: Providing health care and clinical service to patients of the Radiation Oncology service (typically 50% time commitment for tenure-track and 60-70% for clinical-track faculty, but can be adjusted based on individual and service needs); instructing and supervising veterinary students, veterinary technician students, and house officers; building strong relationships with clients and referring veterinarians. Engagement: Participation in committee work, professional organizations and community service, delivery of continuing education programs, and other appropriate activities. Qualifications for the position include a DVM or equivalent degree and ACVR (Radiation Oncology) board certification or board eligibility. A MS, PhD or other additional research training is valued. Candidates should have a sincere interest in providing outstanding clinical service. Candidates must also possess excellent interpersonal, communication, and teaching skills, and be able to work collaboratively with faculty, staff, and house officers to effectively engage students in clinical activities. Salary will be commensurate with the candidate’s qualifications and experience. A background check will be required for employment in this position. The Advanced Veterinary Care Center (AVCC), located in Davie, FL, is seeking ACVIM-certified specialists in small animal internal medicine, oncology, and neurology to join our 24/7 emergency and specialty/referral companion animal hospital, which opened in February 2018. We believe in cultivation, support, and empowerment of experts, leaders, and decision makers. We are seeking self-motivated, energetic, team-oriented individuals to join our existing specialty group, which includes internal medicine, surgery, emergency/critical care, and cardiology. We enjoy strong community support and a robust caseload. Proficiency in subspecialty areas of internal medicine (e.g. endoscopy, renal replacement therapies) is appreciated. ACVIM diplomates with additional certifications (e.g. ACVECC) and bilingual (Spanish) diplomates are particularly needed in our community. Those who may be able to bring additional qualified team members to our community are also encouraged to apply as we seek to fill other key positions. Salary, schedule, and benefits are competitive with industry standards for the qualified individual. AVCC was founded with an emphasis on life-saving disciplines including emergency/critical care, internal medicine, surgery, cardiology, and oncology. We believe there is a difference between specialists and experts. We believe in quality, service, and integrity and we practice what we preach. We are committed to building a team of exceptional individuals who value expertise, collaboration, compassion, and humility, and to creation of a healthy supportive working environment. We are also committed to an exceptional client experience and exemplary relations with the referring veterinary community. Our brand-new facility includes a fully equipped ICU/emergency room, as well as a full in-house laboratory, digital radiography, ultrasound, endoscopy/laparoscopy, 16-slice CT, surgical suites, dedicated space for renal replacement/hemodialysis, and other capacity appropriate to a new state-of-the-art facility. AVCC is located in a nice convenient suburban community just west of Ft. Lauderdale, FL, with easy access to beaches, the Everglades, etc., where you can raise a family and enjoy all of the benefits of the South Florida lifestyle without the congestion of Miami. And for those who love Miami, it’s only 40 minutes away. We are young, growing, and fun – you would be instrumental in helping create something extraordinary. We are in Florida – Any of you reading this from a sub-freezing location? When I left New York for my first job in Florida, it was 5 degrees in Ithaca and it was a balmy 74 degrees in Ft Lauderdale. Given the choice, I choose here. Yes, we all work hard but we also live very well. The Ft Lauderdale/Miami area has tons of activities, food, culture, and easy access to the Caribbean and beyond. Just last weekend, we went to see Hamilton and then strolled through the Ft. Lauderdale Art Fair. The weekend before, we were hiking in a state park. We spent New Year’s Eve at a restaurant on the beach. Before that, it was Art Basel Miami. It reliably feels like vacation. We are not corporate – The owners are clinicians, working and making decisions side-by-side with the entire team. We support and empower our team members and we make a personal commitment to the quality of your opportunity as a purposeful calling and a career. Send all inquiries to Jeff Toll, VMD, DACVIM at jtoll4045@gmail.com. All inquiries are confidential. Let us fly you FIRST CLASS to sunny South Carolina! Come and enjoy our southern hospitality. Your $30,000 sign-on bonus will go a long way in Columbia, South Carolina. South Carolina Veterinary Specialists & Emergency Care in Columbia, South Carolina is seeking an additional Residency-Trained or Board-certified Veterinary Oncologist to join our well-established oncology department. SCVSEC is a collaborative workplace with resources at the ready to help you focus on patient and client care. Our medical campus was designed with workflow and patient care in mind and includes CT, MRI, Antech reference lab, 24-hour emergency services, and all the bells and whistles you would expect. We have an amazing team of veterinarians – light on ego and heavy on clinical expertise, we are constantly working together to care for our patients. The oncology department is continuously growing, working closely with our other services to provide a comprehensive team-based medical approach. SCVSEC offers a comprehensive compensation package, $30,000 signing bonus, 401(k) with match, health benefits, continuing education, paid leave, licensing and memberships. We also cover $2,000 worth of expenses for boards and have a $5,000 moving allowance. Columbia is a great place to live with a low cost of living with well-known Southern hospitality. We have countless parks, rivers, and lakes with easy access to the mountains and the beach. Please contact our oncologist Dr. Becky Brown (bbrown@scvsec.com) or our Hospital Administrator Gretchen Sauer (gretchen@scvsec.com or 803-561-0015) to set up a time to speak and learn why SCVSEC is the place for you! Check us out at www.scvsec.com. The Department of Small Animal Clinical Sciences at the Virginia-Maryland College of Veterinary Medicine invites applications for a full-time faculty position in Medical Oncology at the Assistant or Associate Professor level. This 12-month position is offered as a clinical track position. This is a unique and exciting opportunity to join a multi-disciplinary team in a new facility located within the Virginia Tech Carilion Research Institute’s new biomedical research building in Roanoke. 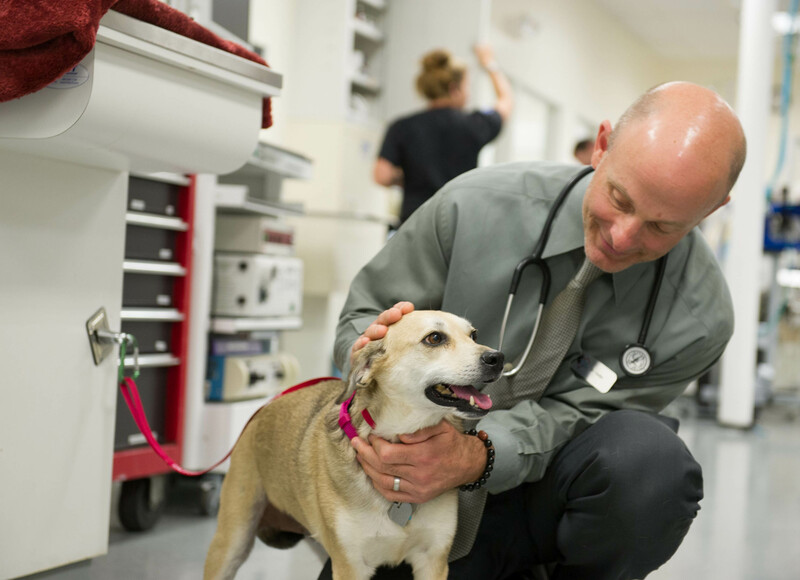 This innovative clinical and research center represents a collaboration between the Virginia Tech Carilion Research Institute and the College of Veterinary Medicine embracing a true One-Health concept. The successful candidate will join an oncology team that will include two other medical oncologists, a radiation oncologist and a dedicated surgeon. The successful candidate will be instrumental in the relocation and expansion of the medical oncology service from the Veterinary Teaching Hospital in Blacksburg, into the integrated cancer center in the Roanoke facility. The Roanoke facility will serve as a premier small animal medical center that provides exceptional, comprehensive and compassionate cancer care. This program will distinguish itself nationally by forming the nexus between human and veterinary medical clinical and translational research with a defined niche on cancers of the brain (primary and secondary). Responsibilities: The primary job responsibility will be to expand the clinical service with an emphasis on clinical translational research and clinical trials. Additional service responsibilities include consultations with the Veterinary Teaching Hospital in Blacksburg and outside referring veterinarians, participate in continuing education programs of the College and participate in faculty governance activities. Teaching responsibilities will include participation in didactic instruction in oncology. Clinical instruction will be directed toward professional DVM students, interns, residents and graduate students from various disciplines, as well as laboratory instruction, where applicable. The applicant must be committed to excellence in patient management, client service, and clinical teaching. Contribution to collaborative and translational research involving but not limited to veterinary clinicians, human physicians, and medical and scientific researchers. Required Qualifications: DVM or equivalent degree. Employer will accept degree that is equivalent to DVM or foreign equivalent of DVM. Successful completion of an ACVIM-approved medical oncology residency. Excellent communication and interpersonal skills. Preferred Qualifications: Diplomate status with ACVIM. Interest and experience in clinical or translational research. Leadership record. If you experience difficulties applying on-line, please contact Angela Duncan at 540-231-7288. Veterinary Specialty Hospital is looking for an oncologist to join our group of Emergency & Critical Care, Surgery, Internal Medicine, Oncology, Ophthalmology, Radiology, Anesthesia, Cardiology, Dentistry and Neurology specialists. We are a 24-hour specialty, emergency, and critical care hospital with three locations, conveniently located in the Triangle area of North Carolina. Our team works to provide high quality and progressive care for our patients and clients. The VSH Oncology team currently includes 4 medical oncologists and 1 radiation oncologist (double boarded in medical and radiation oncology). We are looking for an additional oncologist to join us to help with our growing case load. Candidates should be board certified or have completed residency training. Specialty equipment includes on site CT and MRI, digital radiography, ultrasound, endoscopy, cystoscopy, Antech reference laboratory and a linear accelerator. There are plans underway to develop stereotactic radiotherapy capabilities as well. Our hospital prioritizes communication and collaboration between our associates and would love to add a like-minded, motivated team member to support our growing hospital. Candidates may be expected to spend time at one or more of our locations, as well as participate in a rotating on-call schedule. VSH is in a gorgeous and growing area, with North Carolina beaches and mountains just a short drive in either direction. With world-class museums, historical districts, award winning breweries, dining and music, the area has endless opportunities for entertainment. We understand that quality of life is essential to our team’s success, so we strive to create a work environment that allows our associates to enjoy their time both in and out of the hospital. Our cancer center has grown to the point where we are seeking another oncologist to join our team. We are seeking a full time boarded veterinary oncologist or a resident in their last year of training. We have surgery, internal medicine, rehabilitation medicine, and emergency/critical care services to help us care for our patients. We are a growing private practice located at the southern tip of the Puget Sound, 45 minutes from the Pacific Ocean, and a little over an hour from Mt Rainer and the Olympia Mountains. We value team atmosphere, quality of life while practicing high quality medicine, and innovative perspectives in all our staff.